Iftikhar Chaudhry leaves behind a controversial legacy for Pakistan’s embattled legal system. It’s been a remarkable year for the highest echelons of Pakistani leadership. First, Nawaz Sharif returned to the post of Prime Minister in what marked the first successful transfer of power from one civilian government to another in Pakistani history. Second, Pakistan’s Chief of Army Staff – the most powerful person in the country by certain measures – General Ashfaq Parvez Kayani retired; he was replaced by the counterinsurgency-focused General Raheel Sharif. Iftikhar Muhammad Chaudhry’s retirement last week marks the third major shake-up in Pakistani politics. He was the 18th Chief Justice of Pakistan, a post he held for eight years. Anyone watching Pakistani politics can imagine that the last eight years must have been quite the time to hold the position of Chief Justice. Chaudhry made the most of his time as Chief Justice. He pushed the judiciary to the frontier of political participation when he discharged and ousted Yousaf Raza Gillani and his government in early 2012. Chaudhry’s term was marked with controversy, spurred by his propensity for judiciary activism. Chaudhry’s retirement draws to the fore the weaknesses in Pakistan’s historically inept judiciary – something Chaudhry had tried to address. Chaudhry’s activism led him to acquire more than a few critics on the Pakistani political scene – they charge him with politicizing the court, corruption, and ignoring established legal practices in the pursuit of personal power. Chaudhry expressed a preference for suo moto hearings, dramatically widening the agenda of the court and allowing it to traverse previously uncharted territory. For all Chaudhry did to galvanize the Supreme Court, Pakistan’s district and local courts remain absolutely ineffective – over one million cases remain pending in these courts. The seriousness of an ineffective system of justice at the local level is underscored by the fact that the Pakistani Taliban continues to expand its Sharia courts beyond the tribal belt, including in Karachi. If allowed to continue unchecked, the Taliban could succeed in supplanting the legitimacy of Pakistan’s official courts. In his farewell speech at the Supreme Court of Pakistan, Chaudhry expressed his support for and confidence in his successor: Tassaduq Hussain Jillani. He additionally emphasized the importance of free and fair elections in ensuring that Pakistani democracy remained functional. “The Court has adjudicated on a number of cases relating to the fair conduct of elections in ensuring that fake ballots and the like are not utilized, and electioneering practices are free and fair,” he said, according to Dawn. 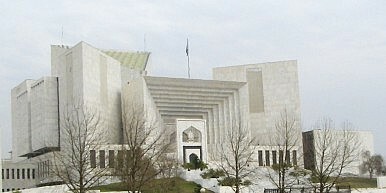 Chaudhry’s legacy is controversial; plenty of evidence supports contentions that he sought personal power and behaved in ways detrimental to the role of the Pakistani judiciary as well as contentions that his judicial activism abetted Pakistan’s pivot away from the Musharraf era into its current civilian-led incarnation. His successor, Jillani, will carry the court into 2014 but will retire in July after turning 65.